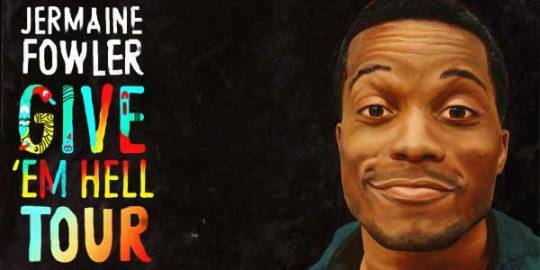 Sheela Namakkal recently interviewed Jermaine Fowler ahead of his standup show (part of the Give ‘Em Hell Tour) at the Turf Club on Thursday, January 14. Tickets are on sale now. Sheela Namakkal: When did you know you wanted to be a comedian? Jermaine Fowler: I was always a comedian. I guess I knew I wanted to get paid for it after watching Eddie Murphy: Raw. SN: Do you prefer stand-up, writing or sketch? JF: I like them all a lot. There are different satisfactions I get from all avenues. Stand-Up gives me visual freedom. Writing gives me intellectual freedom. And Sketch gives me the freedom to just go nuts creatively. SN: You are playing lots of music venues this tour. Do you prefer comedy clubs or alternative venues? JF: I like them both, but I chose the music venues because of the ticket prices were better for my younger fans. SN: Who do you love to perform with? JF: Anybody I can learn from. SN: What is your dream show? SN: Random question: What is your favorite record of 2015? JF: Musically? Angels by Chance the Rapper.